Groceries, O. V. B. Hardware, Majestic Ranges, Retort Heaters, Enameled Ware and Anti-Rust Tinware, Cutlery, Canvas Goods, Tents, Harness and Saddles, Oliver Plows, Studebager Wagons and Buggies, Deering and McCormick Machinery, Stackers and Sweeps, Dry Goods, Boots, Shoes, Sweet-Orr Corduroys, Staley Underwear, Kuppenheimer Clothing, Refrigerators, Oils and Paints, Crockery, Glassware, Trunks, Suit-Cases, Bedding and Sporting Goods and Furnishings. 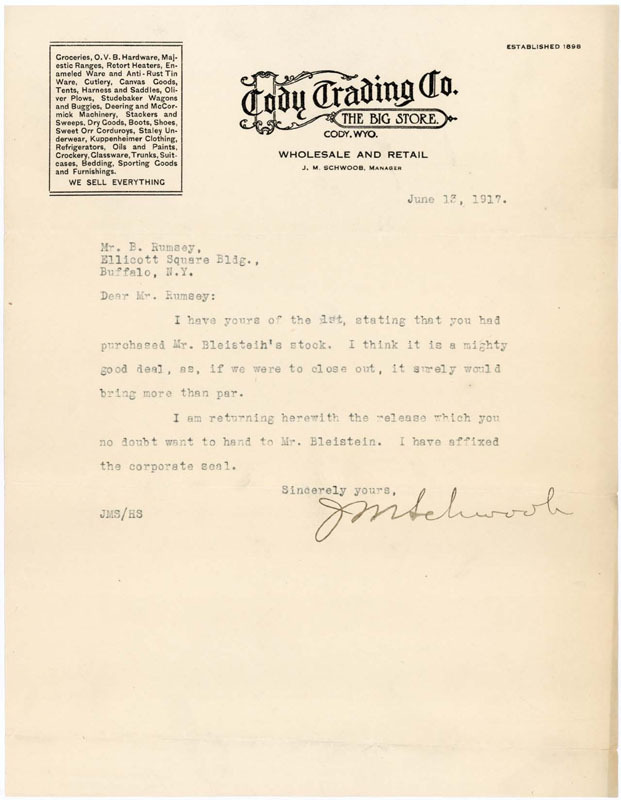 I have yours of the 1st, stating that you had purchased Mr. Bleistein's stock. I think it is a mighty good deal, as, if we were to close out, it surely would bring more than par. 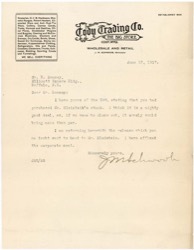 I am returning herewith the release which you no doubt want to hand to Mr. Bleistein. I have affixed the corporate seal.